Trevor made me feel so welcome and special, as he does with all his guests. His hospitality is renowned, which is why so many guests return year after year. Camps Bay Villa is a special combination of spectacular beach, Atlantic Ocean and mountain views, with privacy and exclusive use. Magnificently positioned in Camps Bay, Cape Town, the Villa borders Table Mountain Reserve, in a unique, peaceful setting with unspoilt greenbelt above, below and to the side. 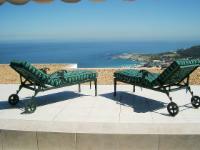 The Villa has three private, non-smoking units, each with secluded, sparkling pool and terrace or garden. The 200-square metre Villa has two upstairs bedrooms, the 150-square metre Penthouse has one upstairs bedroom and the 75-square metre Studio is on one level with an open-plan bedroom. Air-conditioned. Breakfast optional. Trevor’s generous hospitality ensures many happy returning guests. 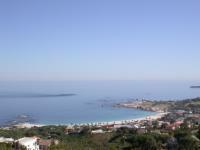 Spend the day relaxing on Camps Bay or Clifton beaches. Table Mountain cable car, V&A Waterfront and City centre nearby. "“Hello Trevor, now our wonderful Time in Southafrica is over. We are on the Airport and saw this beautiful picture from Camps Bay. We will often think about the wonderful days we spent in your beautiful Home. 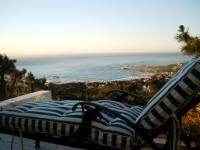 Best regards, take care.”"
"Our recent stay at Camps Bay Villa was just perfect! Trevor, our host was the best we´ve ever experienced regarding friendliness, hospitality and helpfulness. The Villa itself is just outstanding! A quiet and peaceful, luxurious place to relax and enjoy." "All we can say is a very big "Wow"!! Trevor is the most incredible host and made our stay at Camps Bay Villas particularly special.. This is certainly a holiday place to keep returning back to! From oustanding views to an immaculate, very generously sized Villa topped with Trevor's natural ability to make one feel so exceptionally welcome... Nothing was too much trouble to ensure that our stay was truly memorable.. The kitchen was extremely well equipped, the lounge & dining room very spacious and the plunge pool and balcony were just the cherry on top, not to mention a greatly appreciated flat screen TV with a full range of DSTV channels- everything has definitely been thought of.. Thank you Trevor, we shall definitely be back!! Rgrds Mandy & Stephen"
"We stayed 5 nights at Camps Bay Villa. It is perfectly situated, with the 12 Apostle moutains towering behind. The villa has a view to die for, and our appartment had a lovely plunge pool on the balcony. The appartment was beautifully appointed and Trevor could not be more helpful. He got in a welcome pack and more for our breakfasts, and gave us information whenever asked, he was a charming host. Camps Bay itself fulfilled every expectation, we had some really good meals. Thank you for your efficient admin too, Janie Heard"
"Trevor Foster could not have been a more helpful and accommodating host/landlord - he goes above and beyond.The Studio apartment was everything the website claimed it to be. This was the dream location we always wanted while in Cape Town. We have sung the praises to family and friends, and hope some of them are able to avail themselves of this venue - especially of the fantastic upper level apartment. November 2012." From Cape Town drive up Kloof Nek Road, follow the road over the traffic circle into Camps Bay Drive. Follow the road down, past Prima, Ravensteyn avenues on left, next left on mountain side, is Fiskaal. Keep left after turning into Fiskaal, go up in a spiral, Fiskaal ends in cul de sac to left, then Francolin starts. Go up in spiral, come to big open space on left hand side, in front is end of Francolin Road to the left. The villa is the first house at the beginning of the cul de sac, on the mountain side, at the corner, at the beginning of Theresa Avenue. See Camps Bay Villa sign, 48 Francolin Road. The entrance is on the corner to the right, against the mountain side. When using the map, do not turn right to Sea Point at the Harbour/Waterfront traffic light, go straight across towards cable car Kloof Nek arrows!